24V insulated Normally Open contacts, spst, One circuit: Off - On. 85A. Large terminals: Copper 5/16" -24 thread, hexnuts and lockwashers included. 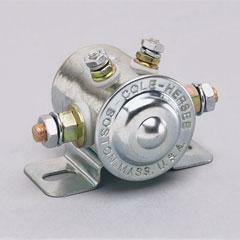 Coil, ignition and ground terminals: Steel 10-32 thread, hexnuts and lockwashers included. Bracket mounting holes 5/16" x 19/32" (7.9 x 15.1) on 2 13/64" centers (56.0mm).